I am uncertain whether or not the Fed will raise rates any time soon. In my view, I think the monetary policy hawks' analysis is widely missing the mark; inflation is not going to be a problem in the United States any time soon. That said, I see little cost to the Fed raising rates. The most plausible reason to worry about a Fed rate hike is that it will cause the U.S. dollar to become "too strong" and create a severe external drag on U.S. growth. It looks to me that the currency markets have already "priced in" rate hikes, and so I do not see a reason for the U.S. dollar to become appreciably stronger versus other developed currencies. There is no doubt that a rate hike would outrage many, and probably cause at least some turbulence in risk markets. However, the risk markets have been acting in an unhinged fashion for a long time now, and there is little reason to believe that a temporary stock price swoon makes any difference to the real economy. The rest of the global economy (and the oil sector) is in a rough state, but that's not really the Fed's problem. Foreign policy makers need to get their act together, and not spend their time wringing their hands over whether the Fed will move the overnight rate 50 basis points in one direction or another. Please note that I am not a fan of stating analysis using this methodology ("a change in variable X causes variable Y to move by Z"), but it typically how economists phrase this type of analysis. The underlying problem is that it is an inherently non-falsifiable statement, since "all else" is never equal. For example, people will justify bad calls on the Canadian dollar exchange rate as a result of oil doing something or another, which allegedly invalidate their assumptions. In other words, their incorrect forecast was "not really" incorrect. However, if you work in finance, you will be expected to couch your analysis in such a fashion, even if it doing so does not make any sense. In other words, I directionally agree with the principle of the statement, but I believe that the "true" answer is squishier and more qualitative. Furthermore, there are questions about what causes this linkage between interest rates and the price of the currency, as I discussed in the previous article. The open question in the statement above is what interest rate one should use when attempting to estimate the relationships between interest rate spreads and currency movements. Since there are strong historical reasons to associate the policy rate with currencies, one might attempt to use the overnight rate. For example, British policymakers hiked rates in an attempt to save the doomed currency parity for the pound within the ERM framework. This is also convenient for analysis at the central bank, as they can attempt to directly tie the policy rate that they set with other economic variables. My feeling is that such an approach will not work. From the point of view of theory, we need to look at expectations about the policy rate, and not just its current level. Although post-Keynesians tend to be allergic to the mainstream focus on "rational expectations" in economic modelling, this is a case where I believe where the focus has to be on expectations. We do not need to believe that "the market" is particularly "efficient" in guessing the future level of interest rates; we just need to assume that the current level of bond yields is a good representation of where those expectations currently lie. The recent experience in the Canadian dollar follows the pattern that I suggest. The Canadian dollar was stronger in the earlier part of the period depicted as there was a belief that the Canadian economy was more robust than the American. The Bank of Canada hiked rates, Canadian bond yields were higher than those in the United States. However, by 2014, the complacency about the Canadian economy evaporated, while the United States continued a pattern of steady, slow growth. The 5-year yields crossed over, as the Canadian bond market moved to discount lower policy rates, while the U.S. Treasury market is patiently waiting for "renormalisation." 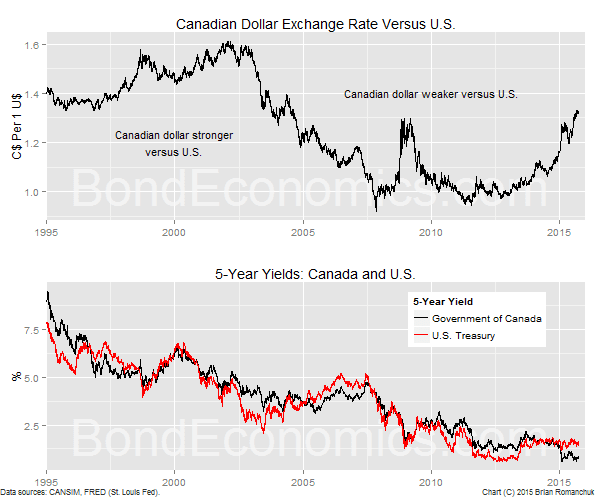 The collapse in the value of the Canadian dollar (reminder: a higher quotation for the exchange rate in the top panel means a weaker Canadian dollar) occurred when the bond yields crossed over, not when the Bank of Canada threw in the towel on its continuously too bullish economic forecasts and cut rates. Certainly, the level of the policy rates themselves tells us almost nothing useful. 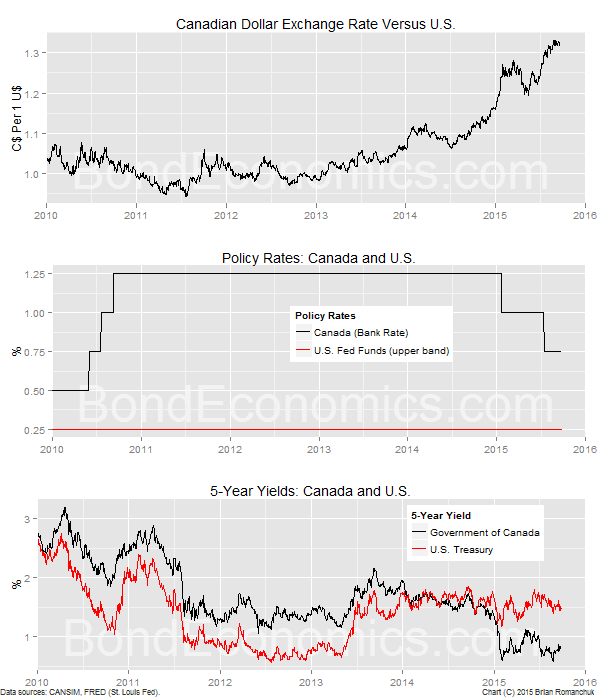 For the entire period depicted, the Canadian policy rate remained above the U.S. one. This did not help the Canadian dollar keep its value. One could possibly try to tell a story about "rates of change" in the policy rate, but it looks to me that the signal from bond yields (that is, rate expectations), is much cleaner. Obviously, there are other factors in play; the collapse in Canadian energy export prices did not help the valuation of the Canadian dollar. As a result, I would not just try to fit these particular series and attempt to isolate a regression coefficient. However, if you are attempting to build such a model, this case provides an example why you want to work with bond yields, not the level of the policy rate. In order to talk about the U.S. dollar more generally, we would need to look at the situation of the currencies of the United States' other major trading partners. I am not particularly interested in currency analysis, but it seems to me that the situation for Canada is qualitatively similar for the other developed economies. Therefore, although I have only thought carefully about the Canadian situation, I think the story for the euro and yen (for example) are similar. If the Fed actually hikes rates some time before 2017, this is already priced into the market. Unless the Fed is extremely aggressive with rate hikes, the spreads for U.S. bond yields versus other markets are unlikely to widen significantly from current levels. Since the U.S. dollar has already appreciated significantly versus its developed trading partners over recent years, I do not see any particular reason for another major leg of USD strength. If the Fed throws in the towel on rate hikes and says something along the lines of "We're all doomed! Doomed, I tell you! ", I do not think a lack of rate hikes will cause measurable U.S. dollar weakness. The situation in the other developed economies is worse. As a result, as I believe that the "currency channel" is one of the most important ways that interest rates affect the real economy, I do not see a Fed rate hike making much of a difference. As a result, although I believe the U.S. economy needs more stimulus rather than restraint, I would not lose a lot of sleep even if they hike rates in the upcoming meetings. Brian do you have access to sectoral balance data? Or could you do a post on Canada's sectoral balances and private debt levels? I can get the Canadian data. I have looked at some Canadian balance sheet data in the past, but I am unsure in what context. I am about to write another book review, but I could turn to the Canadian debt data later.